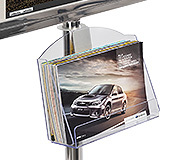 In need of an A3 sign holder stand for your business? 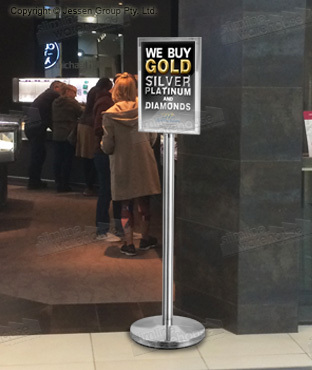 This freestanding poster display will help you market to customers using a durable display that is designed for use in heavily trafficked public areas. The display is made from polished stainless steel, offering the look of chrome that fits in well at retail stores, universities, exhibition halls, restaurants, shopping centres, and so many more! Poster changes are quick and easy thanks to slide-in design, no tools required! 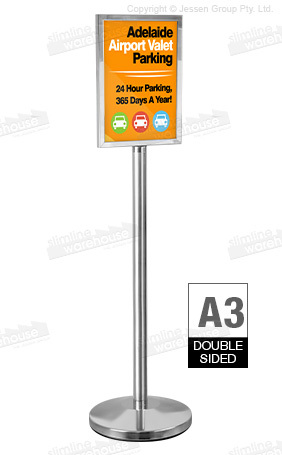 This A3 sign holder stand, like a double-sided poster display, helps you maximise the floor space at your location. You can display an A3 (297 x 420mm) standard sized poster in portrait format to face out from each side of the display! This style lets you reach more visitors from a single spot. The posters are held in place and protected from getting dirty during use by a 2mm thick clear acrylic sheet. This sheet also acts as a deterrent to vandals, preventing them from easily marking the displayed posters. Assembly of the freestanding poster display is quick with no tools required. The display is shipped knocked down to save on shipping costs. 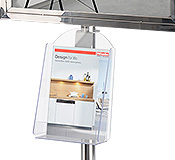 Standing at 1420mm, the dual-sided poster holder is easily viewed and works with any merchandise display. The base is weighted for stabilisation and has a rubber ring to prevent damage to floors. Order by 2pm EST to receive same day despatch to anywhere in Australia with this and most products when in stock!